Fewer than 1 in 3 people with BHD get kidney cancer. BHD patients may develop tumours in both kidneys (bilateral tumours) or more than one tumour in the same kidney at the same time (multifocal). 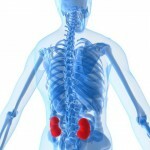 BHD kidney tumours are often benign in their behavior – they grow slowly, and often do not spread. As BHD is a genetic disease, and patients might develop more tumours over time, it is important to strike the right balance between treating kidney tumours early, and not subjecting patients to more medical procedures than needed. Some experts recommend that BHD patients should have a kidney scan every year to monitor their kidneys, while others suggest that patients only need scans every year if they already have tumours, or every three years if they don’t. If possible, it is best to have an MRI scan, as MRI can detect very small tumours and does not emit any radiation. If MRI is not available, ultrasound or CT scanning can be used, but ultrasound does not detect very small tumours, and CT scans emit radiation, which can add up to a high dose if you have scans every year. All experts recommend that tumours should be monitored, and only removed once the largest has grown to 3 cm in diameter. Radical nephrectomy, where a whole kidney is removed, should not be performed unless your doctor thinks it is absolutely necessary, as you might develop tumours in the other kidney later. For this reason, if you are having surgery to remove kidney tumours, it is very important that you tell your surgeon that you have BHD, and might develop more tumours in the future.